About the last thing we need for the ST is another flight simulator. With maybe a dozen already out there, each displaying a different degree of complexity and realism, from a simple outer-space arcade dogfight to a fully detailed carrier-based F-18 Hornet, every armchair pilot should be able to find his favorite set of wings. Still, after testing Falcon from Spectrum Holobyte, I get the feeling that there is room for at least one more. This is probably due as much to the attention paid to teaching you to operate the complex simulator as to the program itself. I've played a lot of flight simulators, and it often takes me hours just to get off the runway, much less actually complete a mission. Setting flaps, revving up, even an operation as simple as starting the engines quickly becomes lost in the confusing collection of keyboard commands. Most packages solve the problem of what key performs a given operation by providing a reference card, but that still leaves open the issue of when to press it. Falcon's superb manual is designed to alleviate this problem as well. Just thumbing through the pages will impress even the most skeptical user. The manual's 130-plus generously illustrated pages tell you not only everything you need to know about the program, but also everything you'd ever want to know about flying an F-16. The first section contains a step-by-step tutorial on taking off—a welcome sight for me. With the manual on my lap and a finger always ready to hit the pause key, I managed to leave the ground on my first try. Additional sections detail each of the many controls and missions contained in the game, as well as advanced fighter tactics. A perfect score of ten for this packaging. In addition, one of the most interesting aspects of Falcon is the unique way in which it approaches the problem of copy protection. Fortunately, like most sophisticated ST games, it eschews a crude disk-protection scheme, opting instead to rely on the entry of a password from the documentation. But rather than requesting the input of a word from an easily photocopied manual, Falcon requests the input of a password from a window in a paper dial, which is twisted to line up two symbols displayed on the screen. This dial, similar to that used to convert inches to centimeters, is a difficult item to copy. As long as copy protection is necessary (and it is), this is the best way to go. Just make the symbols a little more distinct next time. 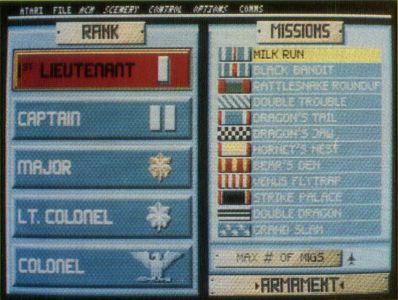 Getting back to the game itself, once you load up, you choose your rank, from First Lieutenant to Colonel, which in turn determines difficulty. Starting at the lowest difficulty level takes some of the sting out of crash landings, while the upper levels provide all the realism of actual combat missions. For instance, Falcon is the first program I've seen that attempts to simulate the blackout that occurs when a fighter jet turns too abruptly. This builds upon the usual difficulty modifiers, such as limited fuel and armaments. As these resources become depleted, it will be up to you to select the proper mix for a successful mission. The package contains 12 missions, which range in difficulty from a simple bombing run to complex dogfights. The display is standard stuff. Your main view is out of the front of your canopy and contains most of your gauges in addition to the heads-up display, which superimposes the most important readouts onto the canopy itself. Left and right cockpit views access additional gauges and warning lights. 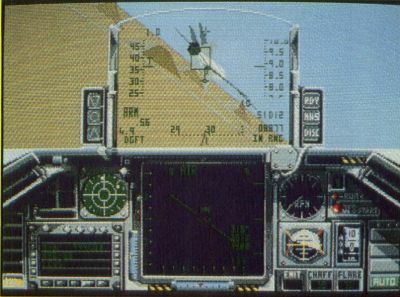 In contrast to the superb graphics that form the cockpit, the landscape is a disappointing but adequate vector-graphic view. Additional features include a black box that records your flight for later analysis and has the ability to play head-to-head (using another computer) via modem. I don't know what more to tell you about Falcon. If you don't already have a flight simulator, you should seriously consider making Falcon your simulator, as no library is complete without one, and Falcon is most definitely flightworthy. 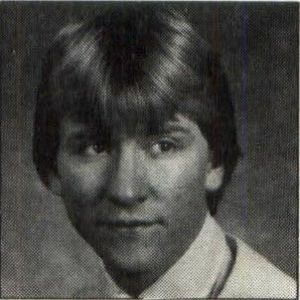 Steve Panak has written more game reviews for ST-LOG and ANALOG Computing than anyone on the planet. He lives in Ohio, where he plays games on his ST and, with the time remaining, practices law.